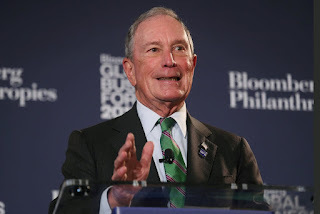 Michael R. Bloomberg, the billionaire former mayor of New York City who is considering a 2020 presidential campaign, will give $20 million to the main Democratic Senate super PAC this week — jolting the national battle for control of the chamber just five weeks away from the midterm elections. Bloomberg’s intervention bolsters the Democrats’ Senate chances by infusing significant late-season capital into the Senate Majority PAC, a group that had $29 million on hand at the end of August and has been purchasing advertising in expensive media markets. Bloomberg — a former Republican and declared political independent — says the emotional national debate over ­sexual-assault allegations against President Trump’s Supreme Court nominee Brett M. Kavanaugh has energized Democratic voters and provides an opening for the party to be more competitive in rallying women and swing voters, his advisers said Tuesday, adding that he sees last week’s contentious hearings as a tipping point. The enormous sum brings Bloomberg — who has already pledged to spend $80 million to support Democratic congressional candidates — up to $100 million in spending commitments for the 2018 election cycle, firmly positioning himself in the Democratic camp as he contemplates a bid for the White House. Sheekey said Bloomberg would send the $20 million check in coming days to the Senate Majority PAC, which works to elect Democrats and is closely aligned with Bloomberg’s longtime friend, Senate Minority Leader Charles E. Schumer (D-N.Y.). Trump’s continued unpopularity among voters nationally and the charged cultural environment around Kavanaugh’s nomination have prompted top Democrats to increasingly turn their attention to the Senate, even as flipping the House remains the party’s focus. As Kavanaugh’s nomination has stalled, Democrats have seen an opportunity as Republicans defend him. Democrats have hoped to strengthen their connection with the #MeToo movement and women nationally, with Democratic senators such as Mazie Hirono (Hawaii) and Amy Klobuchar (Minn.) emerging as party stars.